There are few – if any – apps today that could get away without utilizing email sending capabilities. At the very least, web and mobile applications need the capability to promptly send password reset links when a user forgets his or her password. Additionally, of course, users who buy something these days expect an email receipt. These transactional emails should be sent within a minute – at most. Otherwise, you risk losing users when they tire of repeatedly hitting the refresh button on their email client. You may already know that SparkPost gives companies of all sizes the ability to send fast and dependable email. But we don’t stop there because it’s not enough to have access to the best market-leading email service if you have to become an expert to use it. We want you to be able to integrate our email service easily and efficiently, so you can get back to working on your app’s key functionality. That’s why we’ve made it our mission to make it as easy as possible for developers to integrate SparkPost into their web or mobile apps. 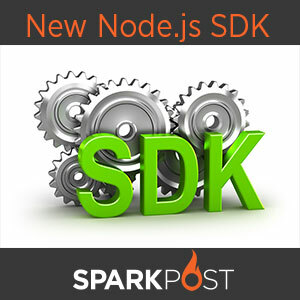 To that end, we most recently released an SDK for Node.js. The SparkPost team is always looking to see what SDKs would benefit our user community. Node.js has become a popular language for developers building scalable enterprise web applications, so we’ve provided a little syntactic sugar for the Node.js crowd. Using our APIs or SDKs, developers typically get up and running with SparkPost in 30 minutes or so. These capabilities will soon be added to our PHP and Python SDKs as well. All of our SDKs are provided as open source through Github, and more will be added in the future. Send me a tweet @aydrianh if you have any new suggestions about SDKs you’d like to see.